Royse City rug repair technicians with KIWI Services provide the kind of rug repair it that is emblematic of centuries long ago. 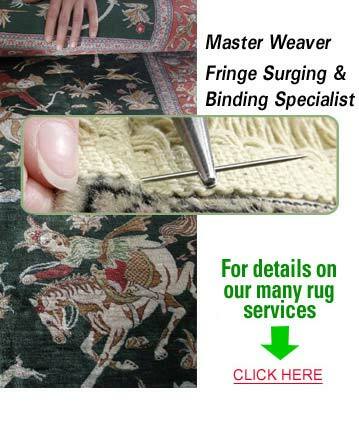 We consider ourselves artisans as well as rug repair experts. As such, we take special care to ensure that no matter how much damage has been done to your rug, it is restored to like-new condition. When we approach a rug repair job, we first inspect the rug to make sure that we are matching the new rug weave as closely as possible to its original rug weave. The Royse City rug repair team is comprised of four unique professionals. First, we have a senior rug expert. Next, we have a master weaver. In addition we also have a fringe expert and a surging expert. Together, this team will help to provide the service and solution that you’re looking for, no matter what kind of rug repair need you have. Whether you’re looking for intricate oriental rug repair, berber rug repair, or any other kind of rug repair service that you could possibly desire, your Royse City rug repair technicians are sure that we can provide you with exceptional service and solutions that you can be happy with for generations to come. Call us today for a free estimate for all of your rug repair needs.